Portrayans a Goethe yn 1826. 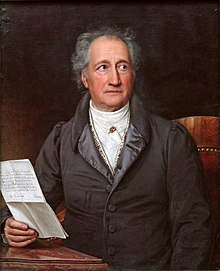 Johann Wolfgang von Goethe (28 Est 1749 – 22 Meurth 1832) o skrifer ha politegiethor almaynek. Y oberennow a gomprehend: bardhonogow epyk ha liennek, yeth plen ha dramas, memours, ombiografi, ha lowr moy. Diwettha chanj an folen ma a veu an 23 Genver 2014, dhe 19:52.